ACK IN NOVEMBER, we uploaded a new Blog Header image. Several people have asked why CARDINAL RATZINGER is featured instead of Pope Emeritus, and I will now explain. At the bottom of the page, you can download the beautiful drawing—but I hope you’ll read my explanation first. Believe it or not, the young Ratzinger has always been on our blog header, but now he’s more prominent. We must remember that honoring one pope does not imply anything about the current pontificate. In Texas, we helped found JOHN PAUL II HIGH SCHOOL, but this wasn’t done in opposition to the pope at that time (Benedict XVI). CARDINAL RATZINGER : It’s no secret that many who hopped on the “B16 Bandwagon for Liturgy” abandoned 1 the movement when Pope Benedict XVI abdicated. However, if you examine the biographies of our contributors, most of us were involved in promoting authentic sacred music long before Benedict XVI was elected. My own family began daily attendance at the Traditional Mass more than a decade before Summorum was issued. The liturgy does not depend on the priorities or “taste” of a pope. Indeed, there were decades in our Church’s history when nobody knew who the true pope was! Yet, the liturgy continued. Assisting at Mass—where Christ is truly present—must be the very summit of our existence. Cardinal Ratzinger is featured because of the crucial role he played before he was elected pope. 2 This does not minimize what he accomplished as pope, and our current pope appointed Cardinal Sarah to continue (Francis’ words) that good work. The most important thing B16 accomplished as pope was to make it impossible for anyone to assert that those desiring authentic liturgy are “living in the past,” because documents such as Summorum Pontificum and Universae Ecclesiae were issued in the last decade, whereas documents like Sacrosanctum Concilium were issued 50+ years ago. It is doubtful whether Francis could have gotten away with his bold CDW choice without the foundation laid by B16. RED HAT : The artist drew Cardinal Ratzinger circa 1988, based on various photographs we provided. The artist used a “modern” technique where only one element—Ratzinger’s hat—is colored, and the rest is black & white. This is symbolic of CCW, where we promote tradition, but use modern techniques to spread it. The image on the right shows Cardinal Ottaviani dressed in his cardinal’s vestments. One reason cardinals wear red is to demonstrate their willingness to shed blood for the Gospel. Ratzinger was certainly a “martyr” in terms of the abuse he suffered from the anti-Catholic press. We believe that today’s church musicians must be “martyrs” to overcome the difficulties they face. But red is also used for the Holy Ghost; how fitting and significant! We require the Holy Ghost’s guidance to be good church musicians! When using this powerful image, please credit CCWATERSHED.ORG and Igor Kazarin; and please consider donating $5.00 per month. Thank you! 1 I recently examined several blogs dedicated to liturgical renewal during the B16 heyday. Many have been abandoned (or might as well be) and this is sad. It demonstrates that these authors—instead of being committed to perennial ideals—simply got caught up with a “trend.” Some blogs which formerly promoted authentic renewal are now dedicated to attacking St. Peter’s Successor. I counted the headlines on a so-called “ultra-traditionalist” blog, and 19 out of 22 were attacks on Pope Francis. Whatever this is, it is not traditionalism. 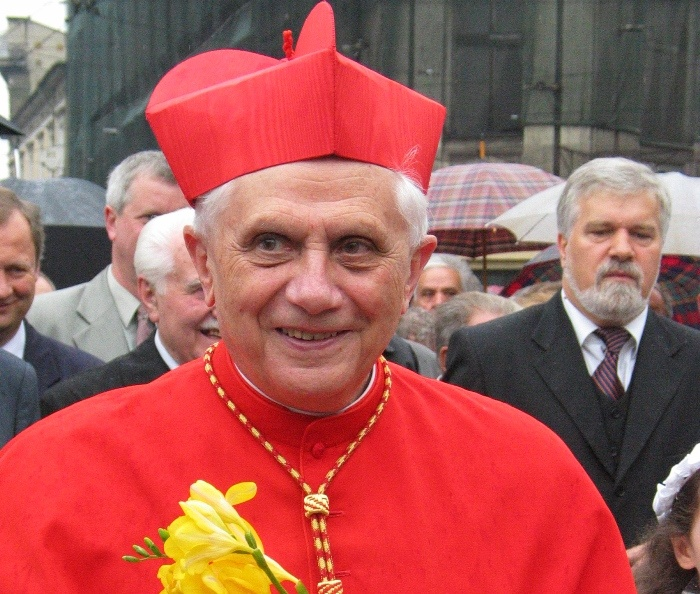 2 Click here to see a picture of a slightly older Cardinal Ratzinger wearing a red cardinal’s biretta.